The Raptors added Serge Ibaka in a trade, adding a mobile big man and joining the Eastern Conference's burgeoning arms race. Another contender has joined the Cavaliers in the East’s developing arms race thanks to one of the league’s most aimless rebuilding franchises. 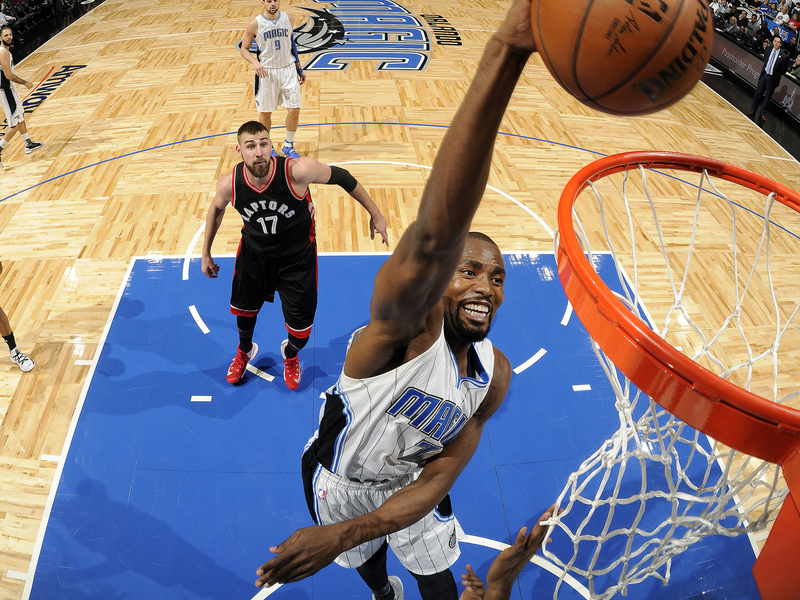 Toronto has agreed to acquire power forward Serge Ibaka from Orlando in exchange for Terrence Ross and a 2017 first-round pick, according to Yahoo Sports. The Raptors will convey to the Magic the less desirable of their two first-round picks (their own and one belonging to the Clippers), which should land in the mid-20s. The Raptors, fresh off the first trip to the East finals in franchise history, needed a midseason boost as badly as any aspiring contender in recent memory. They’re 0–7 against the Cavaliers, Warriors and Spurs this season. Their below-average defense has shown precious little progress. Longstanding frontcourt holes have lingered and coach Dwane Casey had exhausted the Titanic’s deck chair configurations. Most notably, the strain of a recent losing streak led guards DeMar DeRozan and Kyle Lowry to start chirping for roster help. Toronto GM Masai Ujiri faced pressure to “buy” on numerous fronts: to live up to last year’s expectations, to keep up with the Cavaliers who added Kyle Korver last month, to improve his lineup versatility, to stop the backsliding in the East standings from No. 2 to No. 5, to prove to Lowry that they were committed to contention in advance of his summer free agency, and to make the most of the Lowry/DeRozan tandem during their prime years. While he isn’t as desirable as Atlanta’s Paul Millsap, another player the Raptors were linked to in rumors, Ibaka (15.1 PPG, 6.8 RPG, 1.6 BPG) should help on multiple fronts. Most obviously, he plugs in as a ready-made starting power forward, taking over from the likes of Pascal Siakam (a rookie who means well but isn’t ready for postseason primetime), Patrick Patterson (an ideal second-unit big), and Jared Sullinger (an injury-plagued off-season addition who was sent down to the D-League last month). A three-time All-Defensive First Team selection during his time in Oklahoma City, Ibaka didn’t have a transformative defensive impact during his short stint in Orlando. Despite attempting to build their defense from the inside-out around Ibaka, the Magic’s defensive efficiency ranking actually slipped back into the bottom-10 this season, and Ibaka’s block rate decreased for the fifth straight season. Nevertheless, he represents a major upgrade over Toronto’s existing personnel, and he’s better suited to play a defined role on a veteran-dominated roster—like his role with the Thunder—rather than a leading role for a young rebuilding team. When lineups downsize late in postseason games, Ibaka can shift from the four to the five, allowing Casey to construct lineups with Patterson and Ibaka that maximize spacing for his guards without sacrificing his interior defense. Prior to the Ibaka trade, the Raptors were checkmated by the Cavaliers’ smaller looks, as Jonan Valanciunas’s offensive acumen was offset by his defensive limitations and Bebe Nogueira’s defensive length was counteracted by his limited offensive repertoire. With Ibaka, Toronto finally has a balanced answer. Offensively, Ibaka should add some stretch to Toronto’s attack, manning the corners so that Lowry and DeRozan are free to attack in one-on-one situations. Underqualified as a lead option due to his lack of playmaking ability, Ibaka is accustomed to life as a safety valve, whether that’s finishing dump-offs around the basket or keeping defenses honest from mid-range. He should be fully motivated during the Raptors’ stretch run, as he’s no longer stuck with the going-nowhere Magic and he’s playing for a pay day in advance of his first taste of unrestricted free agency this summer. At 27 and with knee surgery in his past, Ibaka’s statistical slippage is concerning, but he’s only missed one game this season and Toronto will be able to test-drive him before they buy. While early indications suggest Toronto will try to re-sign Ibaka this summer, that’s a problem for another day. Locking into a Lowry/DeRozan/Ibaka core at huge contract numbers isn’t especially enticing, and Toronto must first see whether this group can claw its way through an East second-tier that has looked stronger in recent months. But even if Ibaka leaves for nothing this summer, Ujiri made the right call in pursuing him as a rental and he did well to avoid parting with any major assets to get it done. Finally, moving Ross also opens a bigger role for Norman Powell, a solid two-way contributor who, as a 2015 second-round pick, earns less than one-tenth of Ross’s salary. The Raptors therefore achieved much better positional balance, added a veteran with loads of playoff experience, and addressed their biggest weakness without emptying their cupboard of assets. This counts as a clean, logical, and well-timed move, even if the onus remains on Ibaka to prove he can still be a major game-changer like he was earlier in his career. As noted last summer, the Magic made their big mistake in trading for Ibaka in the first place. This trade doesn’t fully undo the damage of the move that sent Victor Oladipo and 2016 lottery pick Domantas Sabonis to the Thunder, but it does count as a reasonable salvage effort. Unfortunately, GMs only get a limited number losing exchanges like this, and Orlando’s Rob Hennigan has more than exhausted his fair share. In the macro sense, Hennigan gets an “F” for backing himself into a corner and being forced to part with Ibaka to avoid an embarrassing free-agency departure come July. Strictly on the terms of this deal and its implications, though, he did all right. Indeed, the Magic’s offense ranks 29th this season—the team’s fifth straight year in the bottom 10—and terrible spacing has been a fatal flaw. Moving Ibaka for Ross will shift promising third-year forward Aaron Gordon back to the four, a change SI.com advocated for last week, and it will allow coach Frank Vogel to, get this, trot out lineups with multiple perimeter shooters at the same time. Orlando’s attack still needs significantly more work, but Ross represents a step in the right direction and he arrives on a reasonable contract ($10 million this season and $10.5 million in each of the next two seasons). He can shift between either wing spot, as lineup combinations require, and he can function with or without the ball. Giving up on Ibaka also helps clear a frontcourt logjam with Bismack Biyombo and Nikola Vucevic. While Orlando surely hoped that Ibaka would emerge as a franchise player and leader of an elite defense—making one of the other two big men expendable—that just didn’t materialize. With zero reason to believe Ibaka would spend the rest of his dwindling prime by re-signing with a team that hasn’t made the playoffs since 2012, admitting the mistake and attempting to reverse it was the best of Hennigan’s bad options. Getting a starting-caliber wing, even one trying to push past a reputation for inconsistency, is more than a party favor for a team that ranks 28th in three-point percentage. As for the pick, it would be easier to get excited if it was higher up the board and if the Magic’s recent track record of drafting and developing players wasn’t so abysmal. But it still counts for something.